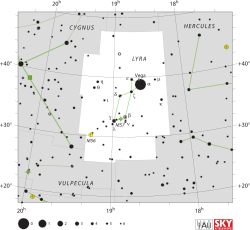 The hairp is the constellation Lyra. The three bricht starns o the first magnitude is kent as the ellwand o starns acause thay are aboot the same distance apairt. Wikimedia Commons haes media relatit tae Lyra. ↑ Ian Ridpath an Wil Tirion (2007). Stars and Planets Guide, Collins, London. ISBN 978-0-00-725120-9. Princeton University Press, Princeton. ISBN 978-0-691-13556-4. This page wis last eeditit on 20 August 2015, at 16:34.